I've been adding healthy pumpkin to my dogs' diets for quite some time. In the Fall, when I'm feeling particularly ambitious, I make pumpkin mush from Halloween pumpkins for Icy and Phoebe. Through most of the year however, I buy canned pumpkin at the pet store or grocery store for them. The canned pumpkin you find at the grocery store usually contains sodium and sugar, even the organic brands, often up to 10 grams of it! My dogs love pumpkin and I want the health benefits associated with pumpkin, but I don't like adding extra salt or sugar to my dogs' diets if I can help it. Icy and Phoebe love pumpkin! I love the health benefits it provides for them. I've never had any luck finding pure canned pumpkin with no added salt or sugar at the grocery store, so I was thrilled when I found canned pure pumpkin at PetSmart! It's made by Authority, which is PetSmart's own brand of pet food, so I trust it for my dogs. When I first spotted it on the shelf at PetSmart, I turned over the can expecting to see sugar and salt in the ingredients list like the brands I've seen at the grocery store. To my delight, there is just ONE ingredient listed - PUMPKIN!! Finally, I found pure, unadulterated pumpkin in a can! I don't know how I missed this in all my weekly trips to PetSmart!? Later on I found cans of pure pumpkin at Target as well, by Market Pantry which is Target's food brand. We like that brand of pure pumpkin too. ** Made up largely of water so it’s a great way to provide extra moisture as well as fiber. ** The oils in both the flesh and seeds of pumpkin can help support urinary health in dogs (and cats too according to PET360). ** A great source of fiber, pumpkin can help with digestive regularity. If your dog is either constipated OR has diarrhea adding pumpkin to their food can be beneficial. 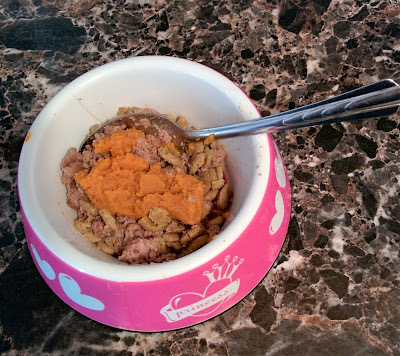 I add 1 to 2 tablespoons to Icy and Phoebe’s food, but consult your Veterinarian about amount and frequency of adding pumpkin to your pet’s diet. ** Canned pumpkin is low in calories, so if your dog needs to lose weight replacing some of their food with pumpkin may help your pooch slim down. I've read that it’s recommended not to replace more than 10% of your pets diet with pumpkin. Don’t give your dog too much pumpkin, too much could have negative effects! ** The fiber contained in pumpkin can help move furballs along a cat’s digestive tract and into the litter box. Small amounts of canned pumpkin, about a teaspoon a day, given to cats can help prevent furballs from forming as well. ** The antioxidants and essential fatty acids contained in pumpkin seeds help moisturize your pet's skin and fur from the inside out. I like to either mix pumpkin directly in with my dogs regular food or give it to them stuffed in a Kong toy. Sometimes I mix the pumpkin with banana, stuff it into a Kong, and freeze it as a special treat on a hot day. Icy and Phoebe love that! Raw pumpkin is not healthy, it should be canned or cooked. ALWAYS consult your Vet before adding any new food to your pet’s diet, even foods labeled as "natural" or "organic". Authority canned pumpkin is made in the USA. No foreign Jack - O' - Lanterns in this can! NOTE: I was not compensated by anyone in any way for writing this post, I am sharing my own experience and opinions. I am not a Veterinarian or Vet Tech, nor do I play one online! I am sharing what I have learned on my own and what my own experience has been in adding pumpkin to my dogs' diets. Interested in more pet health articles? Check out some of my other Pet Health and Wellness blog posts. Follow my Pinterest board, Pet Health, Safety and Well Being. I share informative Pins from some of the most knowledgeable sources! What do you think about feeding pets canned or cooked pumpkin? Leave us a comment and share your thoughts. We LOVE hearing from you! Thanks for sharing this! I occasionally give my pets pumpkin and I will definitely look for this brand now. I'm so happy I found it! Thanks for stopping by kitties! We always have pumpkin on hand! Had to give some to Penny today actually. It's such a great help, especially for constipation & an upset tummy. We give pumpkin fairly often. The dogs love it frozen in summer! Yes, it makes a great healthy frozen treat! Mr. N gets pumpkin when he has an upset stomach. I have to mix it with something though to get him to eat it. Really? I'm surprised he doesn't like it, so many dogs & cats love the taste of pumpkin. I have just started adding pumpkin to my own diet (I use it and beets for a substitute for tomatoes sometimes). May have to explore it for the pups too! That's a great idea, pumpkin & beets. What a healthy combo. Try it for the dogs (always ask your Vet if it's ok to try a new food), I bet they'll love it. So glad this is timely for you! Pumpkin is so healthy, I think it's under rated. I've been giving it to the dogs for awhile now & it really helps w/ upset tummies & constipation. Pumpkin is so good for people and dogs. I will have to check labels-I never noticed canned pumpkin had added salt and sugar. I thought it was just the pumpkin pie filling. Yes, most of the canned pumpkin on grocery shelves contain salt & sugar. I'm so glad Authority makes a pure canned pumpkin w/ nothing added to it. LOL! Yes, it surely will keep the trains running on time! This is great! I didn't know they even had this, but definitely need it. My dogs love pumpkin! I always used the canned pumpkin from the grocery store but I always hated the added sugar & salt. This product is such an improvement, totally pure pumpkin. We Love punkins, they're so good for ya! I give my pack pumpkin once in awhile. Luckily my local grocery store does carry canned pumpkin that is 100% pure pumpkin without any additives. Oh wow, you're so lucky to have a store that carries totally pure pumpkin. I've never been able to find it until I found the Authority canned pumpkin at PetSmart. Enjoy! It's so healthy for them. We've eaten a different brand of pure pumpkin for pets, but this sounds good. I had a hard time finding pure canned pumpkin with no salt or sugar added, that is the best way to serve it. I don't likes the Libby's can pumpkin Ma tries to feed me, cause I had to eat it alot as a wee pup because of colitis. So I don't likes it anymore. It also says it only has pumpkin in it and nothing else, butts maybe this tastes different. I'll have Ma gets some for me, cause tummy troubles can pop up anytime, and this is a good thing to have on hand! Thanks! Tummy troubles are no fun! I'm sorry you had to stuff so much pumpkin in you as a baby, maybe mix some of this with something you love? I've not tried that one. Is it pure pumpkin with nothing added? One less thing to cook is nice! Oh we are BIG fans of adding pumpkin to our dogs meals and I think it does wonders for them - especially our senior dog. Great resources too. Same here, it's so healthy & they love it! I add a tablespoon or two to their food daily. I love the crew to have pumpkin and they love it too. I didn't know that about canned pumpkin from the grocery store. I usually cook one in the fall too, and I'll freeze some of it as well. But then, of course, I have to remember to take it out of the freezer, which I usually don't! I didn't know either! I cooked up our Halloween pumpkin this Fall, I am amazed at how much pumpkin moosh you get out of one small pumpkin! Next Fall I'm going to freeze a bunch of it for sure. Love it! We always add a little pumpkin to our pup's dinner - having it in a can would make it easy peasy! It's so easy from the can! I was delighted to find pure canned pumpkin w/ no additives at PetSmart. They only had a couple of cans on the shelf so I bought them all! I'm so glad to hear of an available option at PetSmart, now! We always keep a can or two in stock in the event either pup has loose stool. Perhaps we'll had a dollop more regularly! Me too! I was so happy to find it. it's great for both constipation AND diarrhea - weird isn't it, that a product could be helpful for both! Pumpkin has a lot of health benefits for dogs and cats. I need to start giving it to Carmine and Lita again. They seem to enjoy it. :) I haven't seen this canned pumpkin in the PetSmart, so I'll have to sneak over to the dog section to see if they're keeping it there. It sure does have great healthy benefits, and helps w/ upset tummies, constipation, & diarrhea. It was hidden in the Authority dog food section, I had never seen it before. We also add a little pumpkin to Ruby's food and she loves it. I have used just regular canned pumpkin. Great to know about this option at PetSmart! My girls LOVE pumpkin added to their food. I was so happy to find Authority canned pumpkin with no salt, sugar or anything else added. Such a great find! We love pumpkin too! So many things you can do with it and I love knowing all the nutritional benefits of it. I love that it's SO healthy for them and that they go wild for it! I love mixing it in their food or freezing it as a treat in several different ways. Thanks for the great review. Nice to know this is available from PetSmart! Pumpkin has been a staple in my Huskies' diet for years, and has helped my furangel Gibson lose weight after his Epi-meds caused him to pack on 16 lbs! So many great health benefits. All my pups get it daily and it helps keep them "regular!" I'm so glad it was helpful for Angel Gibson, that sweet boy. I was really happy to see this on the shelf, it's a great find! Good to know as we love pumpkin and often add to Kilo's kibble for dinner with water. I cook it but much easier if readily available. I found one type in the supermarket earlier this year but then was gone next time I looked. It's so nice to have found a pure canned pumpkin with no additives. It's much easier than cutting & cooking those big clunky pieces of pumpkin! Oh, how we both love pumpkin! When Mom isn't being a slacker, she makes treats for us with pumpkin & peanut butter in them. Yum!!! PS: We saw a comment you left on FiveSibes' blog and thought we'd come say ha-roo! Oh Yummy, pumpkin & PB together!! What a great MOM! So glad you stopped by to say Ha-Roo, we'll swing by your blog too! Wow! I had no idea you could buy canned pumpkin (without any other ingredients) in a pet store. So glad you posted this. Love that you include all the different uses and benefits of canned pumpkin. Great post! I had no idea either! I just happened to spy it on the shelf next to the Authority pet food at PetSmart. I'm so glad I found it, and I'm so glad you enjoyed the post! Yesssssss!! We love pumpkin at our house! Same here! I give it to Phoebe 'cause she's often constipated but I have to give it to Icy too or she gets jealous! It's super healthy for both of them, so I'm happy! I love reading and seeing posts on health benefits of pumpkin. Such a great power fruit! Yum.